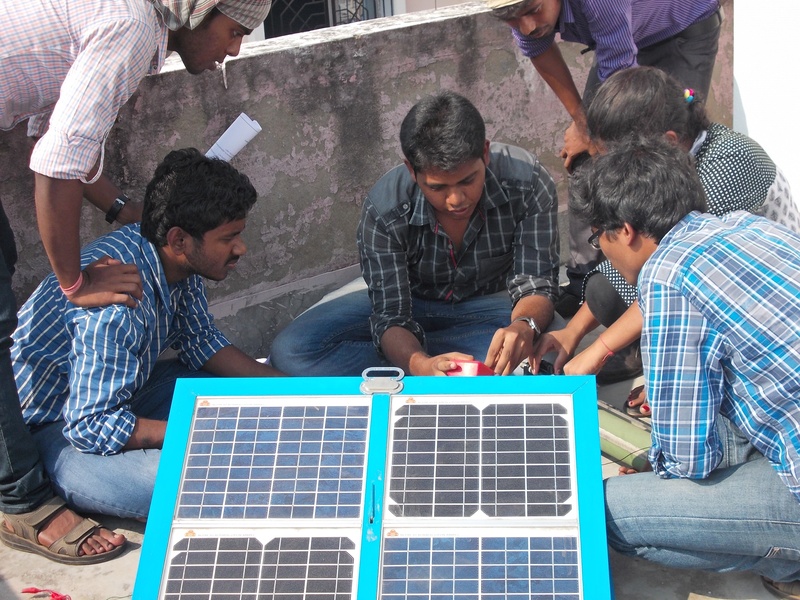 Will India be able to meet its renewable energy targets by 2022? India had announced an ambitious target of achieving 175 gigawatts of renewable energy (RE) installed capacity by 2022, in its Intended Nationally Determined Contribution (INDC) for the Paris Agreement on Climate Change. Currently the country has achieved 62 GW of installed capacity. Even though the country has made policy changes and in turn registered rapid growth in RE in the recent years, there are still bottlenecks that could prevent sustainable growth of the sector. Expert opinion is divided on whether India will be able to achieve its target. At an event in New Delhi recently, New & Renewable Energy Secretary Anand Kumar announced that India would achieve its target of 175 gigawatts (GW) of installed renewable energy capacity well before 2022. “The bidding process will be completed on time and the International Solar Alliance (ISA) will help mobilise sufficient funds for solar energy projects,” he added. Earlier, an official release by the Ministry of New and Renewable Energy (MNRE) revealed that by November 2017, a total of 62 GW renewable power was installed in the country, of which 27 GW was installed since May 2014 and 11.79 GW since January 2017. Historic low tariffs for solar (Rs 2.44/ unit) and Wind (Rs 2.64/ unit) were achieved through transparent bidding and facilitation. Wind turbines in Madhya Pradesh. Photo by Sapna Gopal. 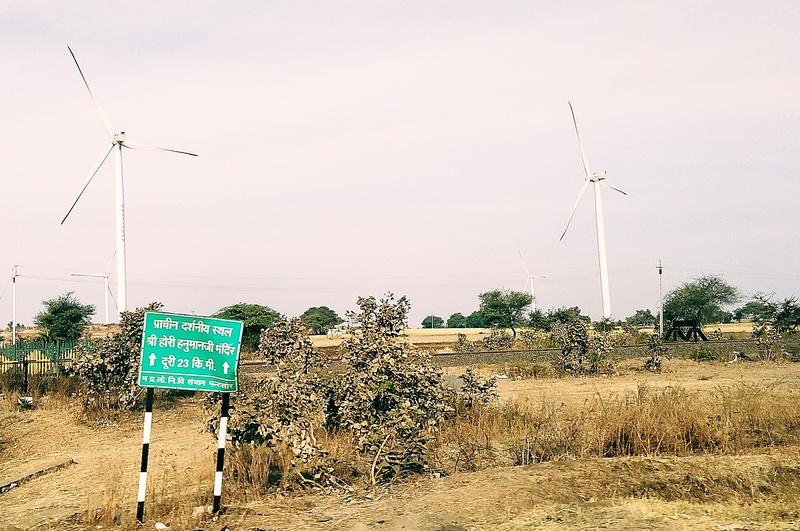 Despite the encouraging numbers though, industry experts have varying views on whether India will be able to meet its target of 40 percent of power from renewable energy (RE) by 2030. “The break-up of India’s 2022 renewable energy target, as per public data, includes 100 GW from solar and 60 GW from wind power.” said a renewable energy expert who did not wish to be named. “The country installed around 60 GW renewable power capacity by November 2017, of which 27 GW, or 43.5 percent, was installed over four years from May 2014. Solar demand forecast in India. Credit: Mercom India Research. “If we really want sustainable RE projects, then the cost should be a bit more,” he reasoned. He reasons that the country stands to benefit significantly from achievement of its RE targets. According to a report by Natural Resources Defense Council, the solar and wind sectors employ nearly 25,000 people. This number is expected to grow 12-fold in the next 5 years. In addition to being a significant avenue for employment, this would also help contribute to cleaner air in cities. 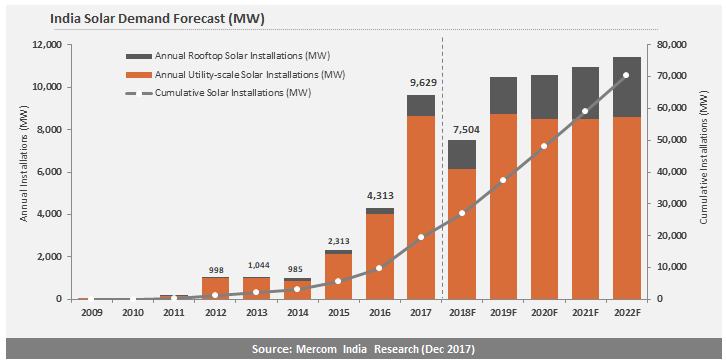 Solar installations in 2017. Credit: Mercom India Research. 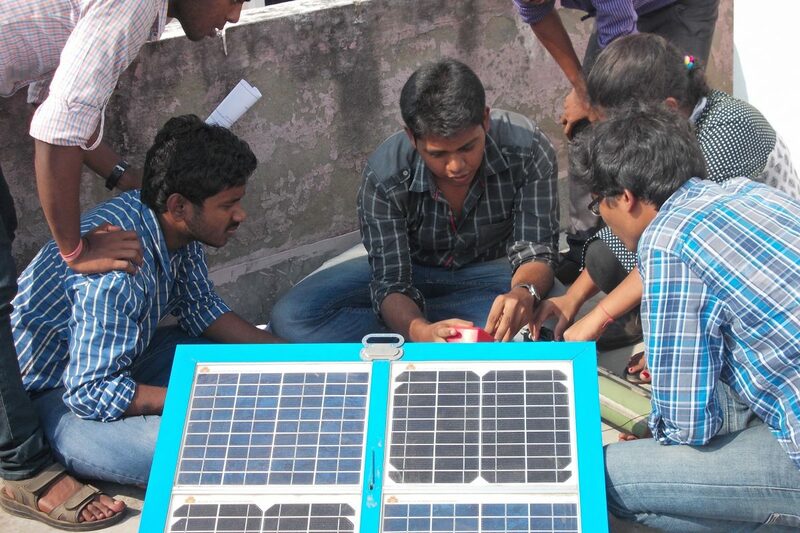 Meanwhile, recent reports have revealed that in the last year, solar and wind energy have been on an upswing in India. 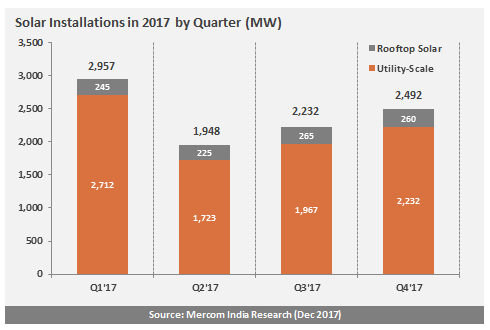 Mercom Communications India, a subsidiary of Mercom Capital Group, released its 2017 Q4 and Annual India Solar Market Update in late February 2018 and revealed that the country achieved a record-high solar installation of 9.6 GW in 2017. The report found that the total solar installation was 123 percent higher than the 4,313 MW added in 2016 and boosted the country’s cumulative solar capacity to 19.6 GW as of December 31, 2017. “Large-scale solar projects accounted for bulk of the installations in 2017, nabbing about 90 percent (8,634 MW) of the total, with the remaining 10 percent (995 MW) coming from rooftop solar installations. Approximately 10.6 GW of large-scale solar projects were under construction, with another 4.3 GW of tenders pending auction as of December 31, 2017,” the report from Mercom added. In yet another finding, the Global Wind Energy Council released its annual market statistics on Feb 14, 2018 and noted that the 2017 market remained above 50 GW, with Europe, India and the offshore sector having record years. Giri adds that as far as wind energy in India is concerned, we have achieved 32 GW and can reach 60 GW by 2022 and add 5 to 7 GW per annum between 2022 and 2030. In spite of the encouraging figures, some more measures need to be put into place, stress industry insiders. There are utility scale power plants which are coming up under the private sector and that is good, but there is also the question of storage, the reliability of RE power, for which the developers are not giving the exact prediction – so, RE projections should be reviewed, he added. Out of the 60 GW, 90 percent of power from RE is concentrated only in south India and western India, whereas the share of eastern India, northeastern India and central India is only 10 percent. As of now, there is no thrust on promotion of RE in these areas. A majority of the country’s population live in central India and eastern India—the population of Uttar Pradesh is 21 crore, in Bihar it is 14 crore and the population of West Bengal is 10 crore—so, for 45 crore people, the per capita generation of RE in this area is significantly low in comparison to the entire country. In Andhra Pradesh, Karnataka, Rajasthan, Gujarat and Tamil Nadu, the RE per capita generation is at least 20 times more and that is creating a disparity. Therefore, if the government does not promote RE in these regions, there will be a disaster in the grid system and there will be uneven development of RE in the country, Chaudhuri warned. Solar energy has registered growth in the past years. Photo by Vinayak Kumar / Wikimedia Commons. In terms of development through RE, sectoral experts believe that growth from RE is always positive and far more sustainable than coal or fossil fuels. Some of the measures which would help the growth of clean energy, according to Giri, include an investor-friendly policy on wind-solar hybrid systems, repowering and increasing export incentives from 2 percent to 5 percent to push “Make in India”. Though India has shown promise in meeting its RE targets, there are still some bottlenecks that need to be handled to reach the objective.